(13 March,2019), 12 people infected with cholera died in Dhamar since the beginning of this year. Medical sources said Sana’a hospitals receives 100 cases of cholera daily. (13 March,2019), Many civilians were killed and injured by Saudi-led coalition targeting a house and a car carrying displaced people escaping the conflicts in Kushar district in governorate. (14 March,2019), Ten abducted journalists, who have been detained on the charge of cooperation with the enemy, face the death penalty. 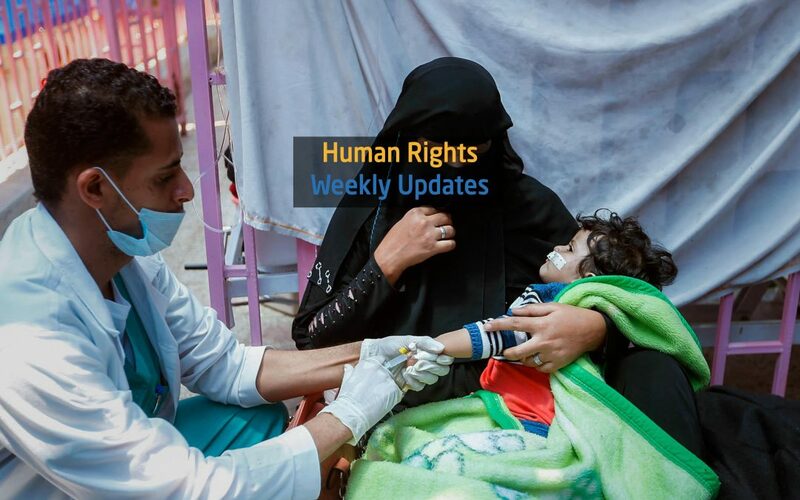 (14 March,2019), The number of deaths has increased in Al-Milywi and Al-Ghodarh villages in Al-Maqatera in Lahj governorate, as a result of reduced health services and the absence of specialized staff. (15 March,2019), A family of four was injured by the explosion of a landmine planted by the Houthi group in Yais village, north of Dale governorate. (15 March,2019), A civilian was killed and more than four were injured by an explosive device planted in Jamal Street in downtown Taiz city. (15 March,2019), Local sources said dozens of civilians were killed and injured, including children and women, during the Houthi group shelling at populated villages of Kushar district in Hajjah governorate. (16 March,2019), Local sources said the Houthi group tossed mortar shells into civilian neighborhoods and destroyed the houses of people in the south of Hodeida city. (17 March,2019), Eyewitness: three civilians were killed as a result of a confrontation between armed men in the interim capital of Aden and two civilians were killed and a woman injured in a confrontation between tribal gunmen in Sana’a. (18 March,2019), The Mothers of Abductees’ Association confirmed that dozens of families of the abductees in Houthi prisons are forced to pay money. In a statement, the association said that 189 families were forced to flee after they were exiled by the Houthis.